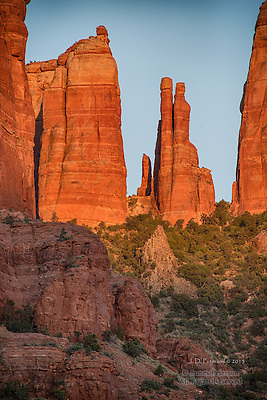 Sedona artist Jim Peterson has a passion for rich, superbly detailed images of the natural world. He articulates his personal vision through a singular blend of classic photographic methods and state-of-the-art digital techniques. He hopes to help preserve our natural legacy by fostering wider appreciation of the intricate beauty in the fragile world that surrounds us. His body of work includes small, intimate portraits of wild beings as well as majestic, room-sized landscapes and panoramas, plus the occasional abstract or experimental composition. He accepts commissions and is available for a limited number of portrait sessions and commercial assignments. He developed a lifelong attachment to the luminous spaces and sculpted forms of the Southwest while growing up in New Mexico. Although he is mostly self-taught, he received valuable early guidance from the late Byron Shurtleff of the Univ. of Delaware, as well as from his brother, Brian H. Peterson (a noted photographer, curator, and author). He earned two degrees (BA in Music and PhD in Biochemistry) from the University of Chicago, but after his postdoctoral work he left the academic world for a long and varied career in telecommunications and computers (also mostly self-taught). In the midst of all that, his hyperactive right brain persisted in streaming out the ideas and vision embodied in his works. Though his art is firmly rooted in his love for the sublime light and quiet shadows of the American West, he has in recent years broadened his range of works by exploring a fanciful world of abstract and altered images. But regardless of the realm in which he works, he remains true to his fascination with the ways that light’s infinite variability reveals – and endlessly alters - the universe of forms, colors, textures, and emotions in which we are forever immersed.